While we’re talking about Lenny Burtman, here’s a few clips from a film he produced, Satan in High Heels (1962). A woman in leather with a riding crop sings “Female of the Species” in a nightclub. 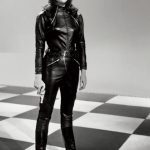 Her preceding makeover and other scenes of retro leather dresses, pants and jodhpurs, not to mention a lot of smoking and drinking.